Today's pretty spring ensemble was put together as an homage to the stunning wedding dress in Disney's live action movie Cinderella. 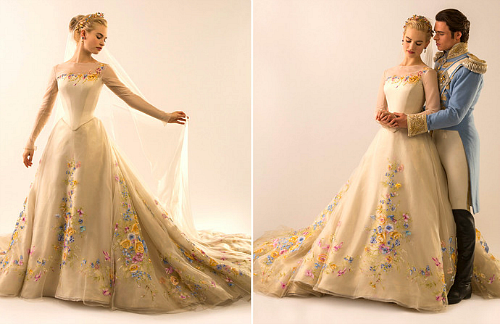 In the movie costume designer Sandy Powell "wanted the costumes to be bold and have an explosion of color as if it were a picture book," but the wedding dress had to embody modesty and pure heart of Cinderella. 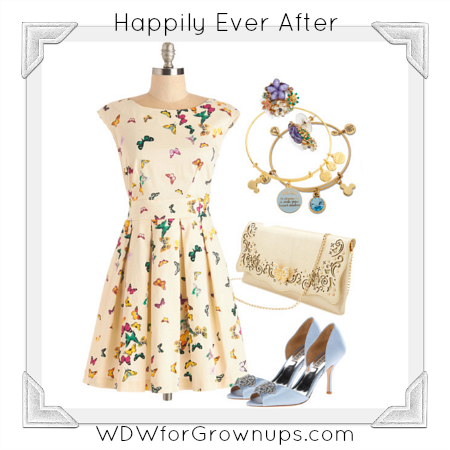 While the wedding dress' detail contained layers of finely hand-painted flowers, our ensemble adds its splash of color with dozens of flittering butterflies (a symbol used for Cinderella in the movie's ball gown). With a modest neckline, and bow-adorned back, playful, pleated skirt, this pretty dress is a classic you'll be able to wear again and again. Badgley Mischka Women's Salsa Pump in Light Blue, prices vary. To learn more about the stunning wedding dress designed for the Disney film, check out this article from Vanity Fair Hollywood. And do go see the movie - in theaters now!